Written by goenKendama on June 14, 2014 . You’ve probably seen videos of guys doing these amazing tricks or maybe your buddies were where you first saw kendama in action. Well none of them started doing tricks like that right away. They needed some basic instruction (from a friend, video, etc.) before they started on the long road to kendama superstar. Here we will detail the some of the basics upon which pretty much all your future tricks will be based. Let’s start with some terminology. English and Japanese names/descriptions will be used interchangeably throughout the blog. One of the other useful techniques, for the first few waza in particular, is pulling the ball up more or less between your body and the ken. With all the action close to your body you’ll have an easier time than trying to stretch out to catch the ball as it moves away from you. The whole movement is vertical and linear, no arcs. Another really important part, particularly when you are just starting out, is using your knees and arm as shock absorbers. By following the ball in flight with your body and arm you are virtually slowing the motion of the ball and giving yourself more time to make the catch. Keeping the ball in roughly the same visual frame over the course of the trick rather than letting it pass going up then again on the way down is what makes it seem like it’s going slower. Yeah at first you may feel a little goofy but the payoff is worth it, not to mention it puts a little exercise in your gaming; bend those knees, work those quads. 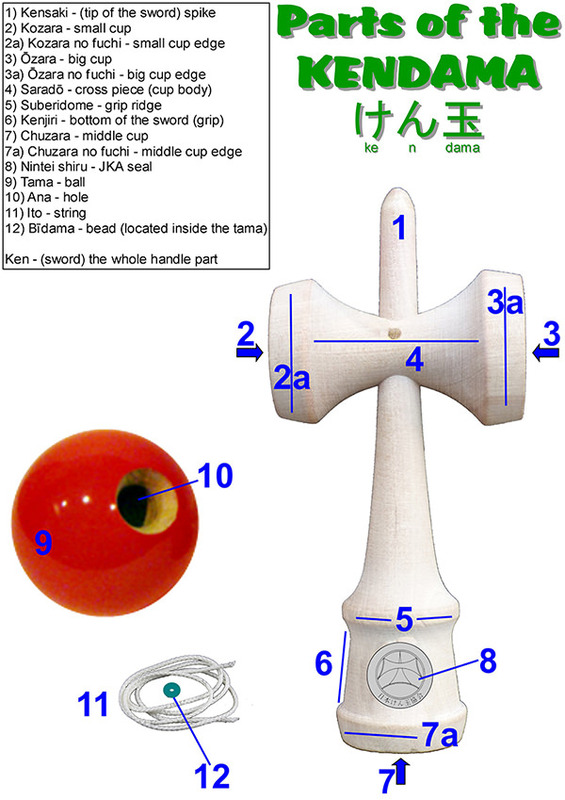 A few other things to think about while you’re jammin’ your kendama: 1) If you get stuck trying a specific trick, switch it up and try a different one to give you a break. You may surprise yourself when you go back and try the first trick. 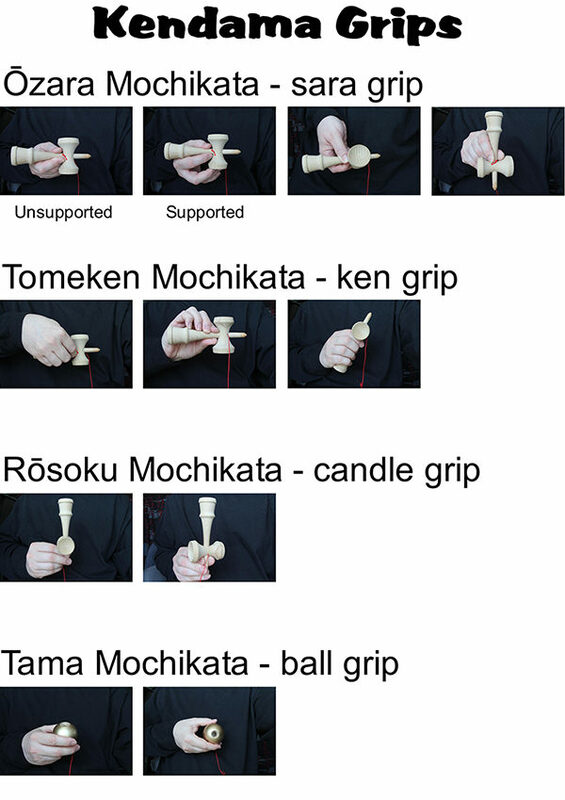 2) A reminder, except for the tricks where you’re actually supposed to swing the tama or ken, like hikoki and furiken, you would be better served keeping the movements mostly vertical particularly for the Kyu level tricks. 3) For spike catches, rather than cup landings, keep an eye on where bright lights are. If the ball moves up into an area with a strong backlight you’ll probably lose track of the hole. Don’t believe us, try furiken facing a brightly lit window then try it facing away from the window. 4) Safety, it shouldn’t need to be said but we’ll say it anyway, high velocity, swinging bits of wood can be dangerous. Take care that you are clear of any breakable items and, while it may work as a defense against vampires, stabbing someone accidentally with your spike is most assuredly not a good idea. Getting beaned with the ball isn’t so much fun either. Be careful out there.